Have You Seen the Shovel? Two days ago I was cruising down Halsted St. on my bike. It was cold, but the pavement was dry and the ride down to school took 35 minutes, ten minutes less than driving. 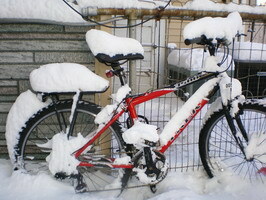 Today, my bike is covered in several inches of snow and so are the roads. I’m not going anywhere. I have written before about how my attitude towards winter in Chicago has evolved over the fifteen years or so that I have been living here. After years of despising the cold, especially the sub-zero cold, I decided last year that winter shouldn’t stop me from doing things that I love to do in Chicago including biking. Last year I outfitted myself with all the winter biking gear and I kept riding. I rode in 20 degrees; I rode in 15. There is, however, a limit, one major obstacle, at least for me. And that’s snow — deep snow. 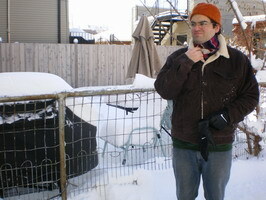 The irony is that despite how much I disliked the sub-zero cold in Chicago, I have always liked the snow. Snow means it’s not sub-zero; it means the temperature is at least thirty degrees. That’s why there’s snow. And snow reminds me of growing up outside of Rochester, New York, where they know from snow. Rochester is an hour south of Buffalo, and Buffalo is famous for snow. Rochester gets its share too. Growing up in Upstate New York, I played often in deep, soft, fluffy, white snow. The best winter memories I have involve being zipped into a blue and white snow suit and belly flopping into a 4 foot snow drift. I also remember snow forts and snowmen and snowball fights and snow angels. I remember “decorating” pine trees around the house with snowballs. I remember icy snow falling into the tops of my boots and dampening my calves. And I remember the icy red marks around my legs when I took the boots off later. I remember my brother and I piling wood onto a sled and dragging the sled across the backyard towards the house. I remember hot chocolate made from sugary packets of instant hot chocolate. I remember this because as an adult I went gourmet with hot cocoa and only use milk, sugar, and European cocoa and I can’t imagine opening a packet and adding water. Ah, the food snobbery. Today, when we woke I wanted to zip up into my blue and white snow suit and bellyflop into the snowdrift in the back patio of my apartment building. I did, eventually, but only after grown-up thoughts about who was going to shovel the walk and when should we brush off the car. But later, after all the grown-up things and errands, Brian stood in the backyard while I let myself fall backwards into eight inches of snow. The cold, dry snow filled the spaces between my arms and legs. With the zeal of a 10 year-old, I flapped my arms and legs like some flightless bird. 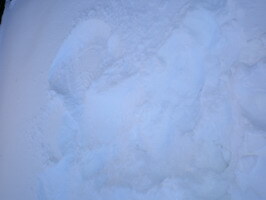 I stood up and there it was: my snow angel. I love the snow too. Something about those of us who grew up in upstate NY, I guess. I’d move back in a second. I love tossing a cat into the snow. The snow was deep enough on the porch — so deep I couldn’t open the door — that I could drop Rosie into the snow so that she was motionless. She started pawing her way out and back into the house. “Sure, it looks great from the inside,” I said to her. « All Hail the Queen!